Carrie is pregnant with her second child and is starting to show. She's looking for some transitional pieces (mainly dresses and tops) to use over the next few months as her belly grows. She's not quite ready to jump back into her maternity clothes! She's still wearing her regular pants and jeans thanks to a belly band, so doesn't need those at the moment. She is a teacher but also has a 10 month old to chase after so she needs clothing that works for both roles. She likes Jennifer Aniston and Reese Witherspoon's style. Here are the dress and top suggestions I sent Carrie, you can click on any image for more information. I also put together some outfits using the dresses and tops that would be appropriate for work or play. I LOVE the maxi dress shown, although all are great. I think it would look so cute for summer with Carrie's bump, maybe throw a denim jacket over top if it's chilly. I would suggest putting a cami under this for work - this dress would also be great for casual, just throw on some sandals and go! This top would also work well for casual situations, pair it with some jeans and fun jewelry and you're all set. It also comes in white. This top would also look great under a blazer and paired with dress pants for work. I chose maternity leggings for this just so the waistband wouldn't be cutting into her growing belly. 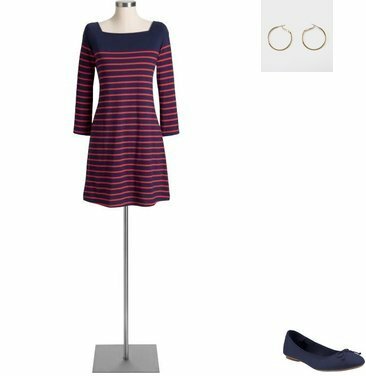 I think this dress is so cute, and paired with some skinny ankle length trousers (seen above in grey) as a tunic style top would make it transition easily to work. Any expectant mothers out there have some style suggestions to share with Carrie? Share in the comments below! Also Carrie should check out thefrugalistadiaries.blogspot.com for more 'non' typical maternity ideas! Megan - Thanks for the link, I'm sure it will be very helpful for Carrie!